Habitat for Humanity ReStore | Canton, Ohio's favorite thrift store! Save $5 Today! Click here to sign up for ReStore sales alerts and instantly get a coupon worth $5 off your next purchase. Spring cleaning is a breeze with FREE donation pickup. Let us do the heavy lifting—we offer FREE donation pickup, and scheduling couldn’t be easier. Schedule online or call us today! At ReStore, enjoy big savings on one-of-a-kind finds. Shop at ReStore and find quality new and gently used home you won’t find anywhere else—and save 50-90% off regular retail prices. Free home training from people who know homes. Through a partnership with the City of Canton, Habitat is helping city residents learn vital home maintenance skills in a free one day course. Come and see all the ways we've made ReStore in Canton, Ohio even better—all to make sure you have a great experience while saving money on home good and building supplies. We made more space to show you more great items. We organized and expanded our building materials. We optimized our layout to get items to the sales floor faster. We lowered prices storewide to get you even better deals. We updated our dock to further improve team safety. What can you buy and donate at ReStore? We’re proud to be your favorite thrift store, Canton, Ohio! If you’re shopping for a truly great deal or want to donate your unwanted items, visit ReStore to see why readers of The Canton Repository have named us Best Thrift Store for three years in a row! We can’t say thank you enough to our community for shopping, donating, and helping us build homes with hard-working families who have partnered with Habitat for Humanity. Habitat ReStore is the store that builds homes. Habitat for Humanity ReStore is a non-profit thrift store with a vision of a world where everyone has a decent place to live. When you donate and shop for new and gently used furniture, appliances, home décor, and building supplies at Habitat for Humanity ReStore, the proceeds help build homes in your community with local families who have partnered with Habitat for Humanity East Central Ohio to build and purchase their own home. That’s why we have a saying: DONATE. SHOP. CHANGE A LIFE. Little things can make a really big difference. Habitat for Humanity ReStore is more than just a home improvement store. It’s a community improvement store. Our inventory is donated from people just like you. When your donated items are sold, the proceeds help Habitat for Humanity East Central Ohio create safe, stable, and affordable housing with local families in need. Your donations and purchases are gifts that make an impact for generations to come. 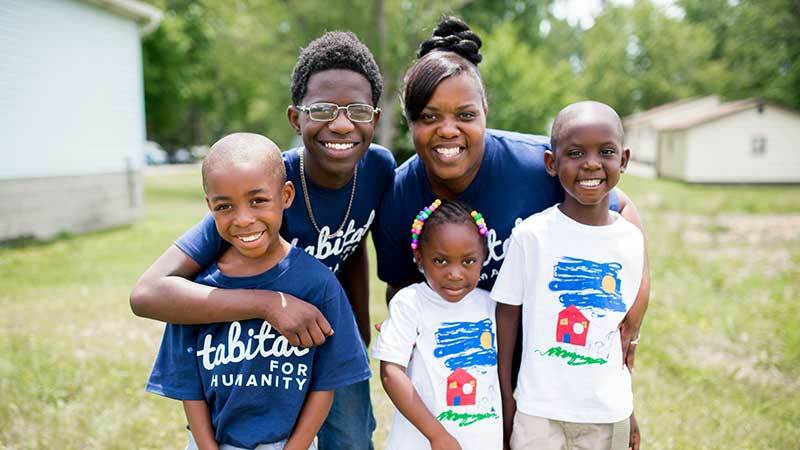 Build a brighter future with Habitat. Habitat for Humanity ReStore is a key part of how Habitat for Humanity East Central Ohio offers families and individuals the strength, stability, and self-reliance that comes with owning a safe, decent, affordable home.